I’m up right now in Jasper National Park attending the Dark Sky Festival. And well I have another article and some photography coming from up here in a little bit, I was too jacked up on this right now not to post something instantly. I got the chance to sit in on a media Q&A with Astronaut Col. Chris Hadfield who is an absolute legend in Canada and around the world. The man is essentially as big a celebrity as can be right now in the country. For me, well I am a huge fan of the things he did in bringing the science of things to light for the masses, it’s his photography that has really left an impression on me. Thus, when I got the chance, I made sure to ask Chris Hadfield a photography related question. I asked him about his set up in space, and how do he stabilized in zero gravity with a planet moving so quickly below you? And, after taking a shot at my travel monopod, he gave me an answer more fascinating than I could imagine. Check out his answer in the video. Obviously, when you’re standing in a room with an absolute legend like Chris Hadfield, who has story upon story that will just blow your mind, there are a lot of interesting things that are said. He talked about how mankind has far too much of a myopic approach to life, and what it was like to watch the world spin a complete circle every couple hours, but the one thing that stuck with me was when he mentioned that they’d shoot the camera as it was just “floating” in zero-gravity. For some reason, that triggered absolute wonder from me. I couldn’t imagine taking a picture as my camera just floated in front of me. Anyways, mark Chris Hadfield down as the person I’d like most to have a beer and chat photography with. I think the things he’s seen, and the photographs he’s taken are out of this world, and I guess that can be taken figuratively as much as literally. If you haven’t seen his images from space check this out, it’s unreal! I’m on an absolute buzz here. Photo geek out, full on. Loads more to come from Jasper, so stay tuned! Previous ArticleHow to Make them Mountains Sing! When we visited Kennedy Space Centre the first thing we did was book lunch with an Astronaut. Our speaker had such and interesting story and intriguing take on life. Yup, any astronaut has stories. The beauty of Chris Hadfield is he’s willing to share them in such an insightful and educational manner. Such an inspiration. Awesome question. Love his presence and how humble he is in his responses and approach. A true educator. Lot of stuff in that answer that makes perfect sense, but which I never had considered. Enlightening. Totally. I should really post more video from the event, because he really was amazing to listen to. 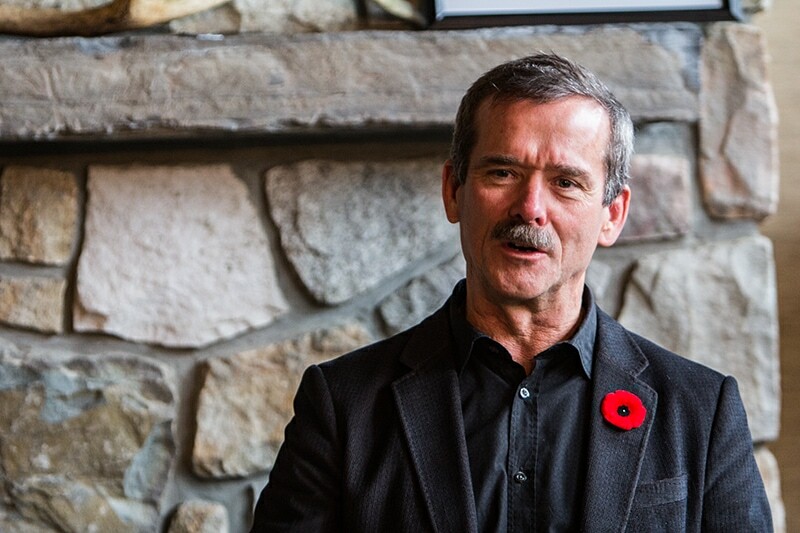 The stories Chris Hadfield has are endless. Interesting! Lucky you to meet him! If you think about the Moon it is about 400 000 kilometres away from Earth. Still it is easy to photograph details on the Moon from earth. The height of orbit of the International Space Station is 420km, this means that the Earth is musch closer to the ISS, than the Moon is to an observer on Earth. Also when photographing straight up or down the light rays only have to pass through about 10 kilometres of dense air in the atmosphere. When we photograph on Earth the light rays have to pass a lot more dense air which distort the image. I have photographed airplanes from sea level at at distance of 100km at a height of 10km close to the horizon. Great question! I always wondered myself. I always assumed they had these big fancy devices that had a mechanical guide for turning with the earth or something. The fact that they shoot just suspended in the air is crazy. Nice job at the interview! Thanks Chris, Col. Hadfield must be the easiest interview in the world. I think no matter what you ask him, he’s got some amazing story to share!